We keep hearing from our editors that you'd like a more flexible document series. At the moment, you can add a title and a summary to a document series, but the documents themselves are automatically grouped by content type and ordered by publication date. This arbitrary grouping is not helpful for users, and is frustrating for those who create document series. It would be better to 'curate' document series into meaningful sections, under headings, each with their own summary text. These sections might be things like themes, time periods, or regions. Not only have editors told us that this is something they want, but we can see them mis-using other formats, in particular the detailed guide format, to try to achieve this same thing (eg https://www.gov.uk/transport-statistics-notes-and-guidance-national-travel-survey or https://www.gov.uk/managing-fluorinated-gases-and-ozone-depleting-substances). So we're improving the document series format to allow curation. This sprint, we'll take our first step towards achieving that. By the end of this sprint, you will add documents from the document series interface, rather than via the edit form on a publication. You will also be able to order the documents within the series (but not yet organise them into sections with headings). Document series will now have a tabbed interface in the publishing tool. 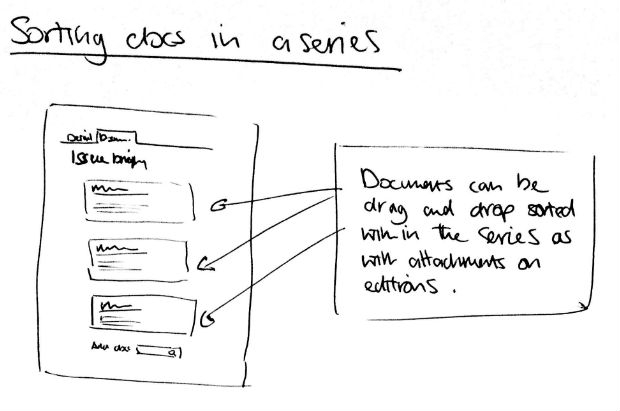 The primary tab will allow the basic document series information to be edited - title and summary of the series. The second tab will be for managing the documents in the series. This tab will have an auto-completing search field that allows documents to be found easily in publisher and added to the series. Documents will also be sortable on this tab. We'd be glad to hear any feedback you have. We too have been guilty of using standalone pages to 'curate' document lists. We've been referring to them as 'document navigators'. But this functionality will give us a better way of doing this, and in a way that's simpler for users. Document series used to include statistical data sets. It appears they have gone now, is this correct? You can still include statistical data sets in document series, but they are not any more automatically separated from other kinds of documents. We have just completed the work to allow grouping of documents under editable headings, and this will go live shortly - this will let you put statistical data sets into a group with other kinds of documents, or in a separate group, depending on the context and user need.